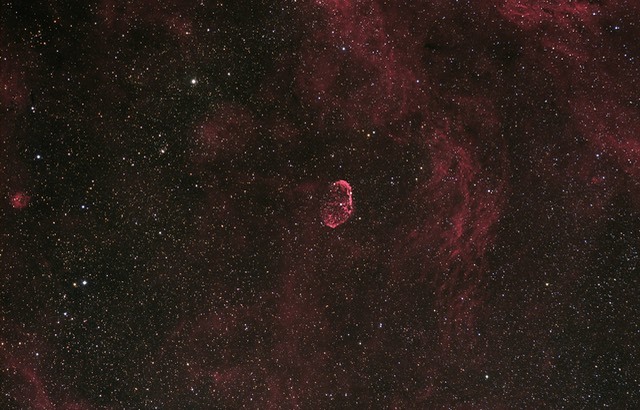 The Crescent or Brain Nebula, as it is sometimes called, is located in the constellation of Cygnus. It is the outer shell of a red super red giant star that will at some point become a super nova. This image was exposed for 2 1/2 hours through a hydrogen-alpha filter and 90 minutes through RGB filters. It was taken in November of 2006. You can also see the rich nebulosity around the Crescent along with a small, round emission nebula to the center left. In the enlarged view you can see the variety of colors that make this area of the sky so rich.